Torla Spain is a small community of just over two hundred habitants high in the Spanish Pyrennes and providing the gateway to the Ordesa national park. Whilst around half of the population earn their living from typical mountain farms the remainder are employed by the tourism and hospitality industry which maintains a variety of restaurants and hotels in the village. Famous within Spain for its traquility and true back to nature feel Torla is popular with walkers exploring the Pyrennes mountains through small mountain tracks up to the famous GR11. Facilities in the village provide just about all the visitor needs for anything from activity holidays or simply a Spanish romantic weekend! As a part of Aragon the majority of transport links from the village are to the Aragonese cities of Zaragoza and Huesca. For 99% of visitors their journey starts in Zaragoza and as such the instructions for "Getting to Torla" further down the page are from Zaragoza. (If you are travelling from Huesca you're already 80kms along the route). Principally the village provides access to the high mountainous passes of the Pyrennes that cross into France. 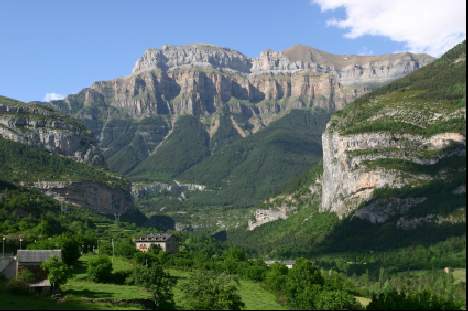 A frontier town since the middle ages its now popular with hillwalkers and nature lovers wishing to get away from town and city life and explore the protected Spanish Ordesa national park in the Pyrennes. Departing from Zaragoza one follows the signs for Huesca and takes the A-23 until, and continuing along it after it converts into the N-330 as far as Sabiñánigo. Here one has to change to the N-260 which leads to the small village of Broto. From Broto its a 1.5km uphill drive to Torla itself. Approximate total travel time is just over 2 hours for the 160km. If one is approaching from France then the E7 to Jaca where the road changes to the A-23 motorway brings you to Sabiñánigo. From here one picks up the route to Biescas. Whatever the route chosen drivers should be aware of road and mountain pass closures in Winter depending on snowfalls and road conditions. From Zaragoza there is a once daily bus service (except Fridays which have two services) to Torla that connects in the town of Sabiñánigo. The coach also passes via and stops in Huesca in both directions so facilitating a visit to the city of Huesca if it interests the tourist. Departures from Zaragoza are at a sprightly 0830 (arriving 1200) and a more relaxed 1530 for the reverse journey (arrival Zaragoza 1945). Connections are 30-40 minutes in Sabiñánigo which means theres no posibility of missing your connection. Total cost is €15 in each direction and all departures are from the central bus station in Zaragoza. All services are operated by Alosa who, unfortunately, haven't yet produced their website in an English version.